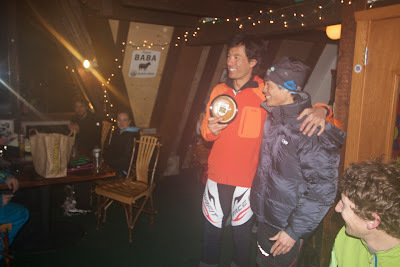 Last night we held our penultimate race for the year and I think it was another great success. 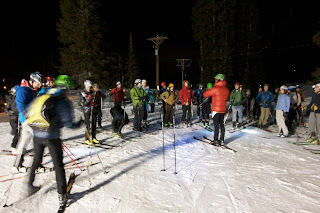 Around 35 people showed up to suffer and have fun with friends for 60 minutes. 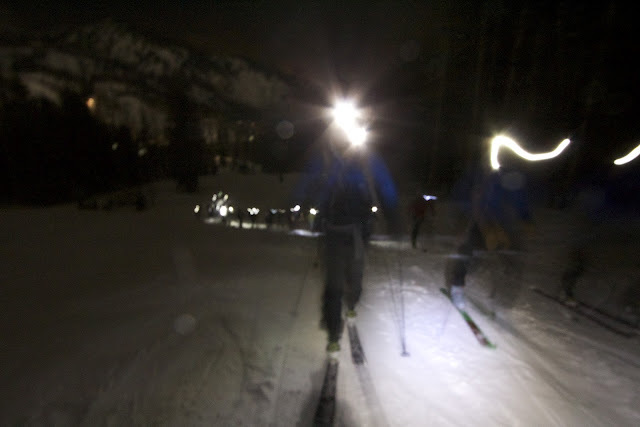 We warmed up together to the base of the Snake Creek lift where the usual crooked start line was drawn in the snow. After a couple announcements, I gave the starting commands and 3 dozen athletes of varying backgrounds were off. They were all chasing their own goals. For some, it was a desire to beat a friend. For others, a certain number of laps equated to success. Some were just happy to be hiking in the sharp night air amongst friends. After putting away the camera, I gave chase and caught the leaders who seemed to have arranged some sort of “gentleman’s agreement” to take it semi easy on the first lap, allowing everyone to warm up properly. I hung around for a few more laps and then reverted to “race director” and took pics/video of the whole crew. It looked initially like it might be a competitive race between Jason, Jared, Tom, Tom, Teague, Courtney, Layne, Chad, Chad, and others (sorry if I didn’t see you up front). But, one by one skin failures, binding malfunctions, or natural attrition resulted in a two man race. Jason claims he was toying with Jared but then he lost his skin and he looked like a fool, unable to catch up over the final minutes. A few random pictures of people getting after it above. 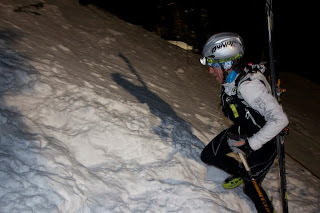 As for the women, Gemma Arro Ribot, fresh off a 2nd place finish in the European Skimo Championships, hung with most of the men and turned in the most laps. 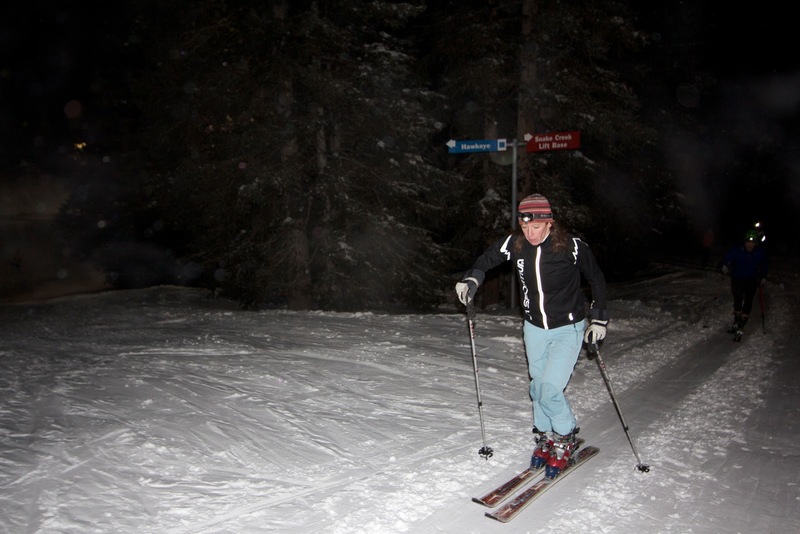 It was great to see at least five other women out racing the men as well. After the hour of pain, most people skied down for the traditional after race party at Molly Green’s for drinks, food, and prizes. Minus 33 was the sponsor for the evening and donated hats and a couple proform cards. Pumpkin pies were handed out to Jared and Gemma and then to newcomers, the Diegle brothers, and to Layne and Toph for making every race thus far. Join us next week for our last race of the series. We will be having another team sprint relay where someone on race gear and spandex is paired with someone on traditional gear. The first team to complete 4 laps (two each) will be declared the winners. 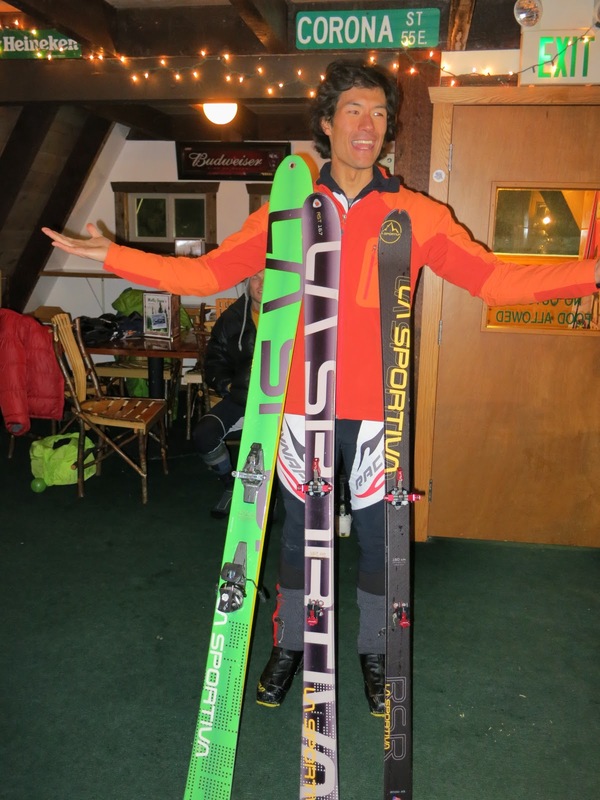 They will get a pumpkin pie and someone will win a pair of brand new skis from our main sponsor, La Sportiva, in the season finale raffle. 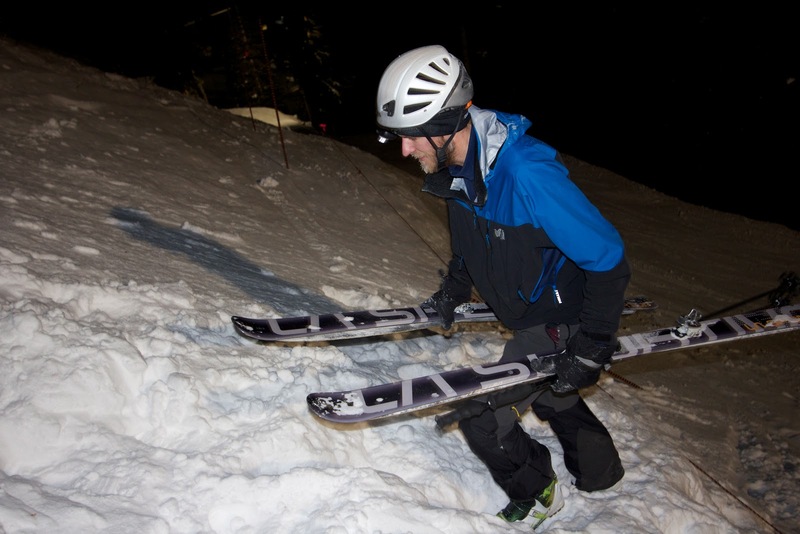 Series sponsor La Sportiva will be giving away a new pair of skis next week! The skis above a just a few in their new line.